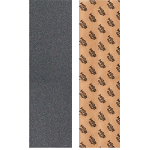 Mob Grip Black Skateboard Griptape Sheet 9" x 33"
The Creature Revenge 8.6" Skateboard Deck is part of the Junji Ito series. Junji Ito is a famous Japanese Manga Horror artist and has collaborated his artwork beautifully with this big 8.6" beast. The haunting graphics will send fear into any street obstacle or transition. Comes with extra wheel base holes to customize your set up to suit you riding. A wider popsicle deck designed for max control and stability on big transitions or for someone whos prefers a wide, modern shape. Classic Creature concave and 100% North American Maple.